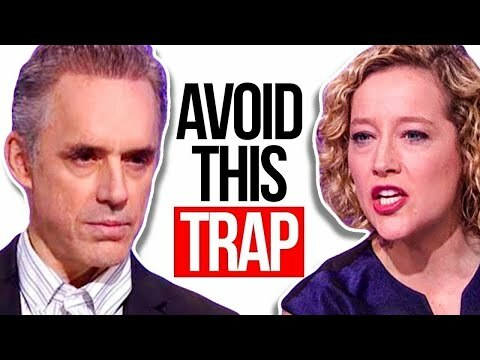 Have you seen the Jordan Peterson and Cathy Newman debate? See for yourself how he deals with it and give us your opinion in the comments! We've all found ourselves in conversation and felt attacked like we started off talking about one thing and then the other person twisted our words and before we knew it, we lost our cool, lost respect in their eyes, and maybe even acted like a jerk. Now, I don't normally do the same person twice in a row but this interview between Cathy Newman and Jordan Peterson was just too interesting of an opportunity to discuss how you can handle someone who uses subtle conversational tricks to bully you into looking dumb. So in this video, you're gonna see firsthand some of the most common tricks that people might be using on you and you're also gonna learn how to reverse those so that you can walk out of a kind of aggressive situation having earned more respect than you had going in. So first off, to stop a conversational bully, you have to realize what's going on before it's too late. Now, typically, a person will reveal their aggressive attitude early on with their tone of voice and their word choice. Check out the rest that we will show in this video and how Jordan Peterson tackles them. 2:39 Jordan Peterson deals with the "assuming the sale"